There are no comparable products that combine extreme levels of the critical Branched – Chain Amino Acids – l-Leucine, l-IsoLeucine, & l-Valine to promote recovery, improve athletic performance & build lean muscle. One of our 28g serving gives you 9g of l-leucine along with 2g l-Isoleucine & 2g of l-Valine, in addition to other performance enhancing ingredients. The key the our formula is the move from the standard 2:1:1 to the higher 9:2:2. Recommended Use: As a dietary supplement, mix one (1) scoop 28g with 25oz (750ml) of water or your preferred beverage. Shake well and consume during exercise or training days or between meals on non-training days. Essential for maximum exercise performance, L-Leucine is the most important of the 3 branched-chain amino acids. For that reason, Advanced BCAA+ is built around 9G per 28G serving of this potent amino acid, instead of the usual 2G. The most abundant of the 3 BCAAs in muscle, L-Leucine has the capacity to directly stimulate muscle protein synthesis, helping to build lean muscle mass. L-Leucine suppresses exercise-induced protein breakdown, sparing muscle tissue from being used as energy by the body. The L-Isoleucine in Advanced BCAA+ plays a significant role in increasing endurance and helping heal, repair and grow muscle tissue damaged from injury and strenuous exercise and training. In balance with the other two BCAAs, L-Isoleucine is broken down within the muscle tissue to utilize glucose during intense activity. Additionally, this amino acid helps to regulate blood sugar levels to stabilize energy levels. L-Valine works with the other two BCAAs, L-isoleucine and L-leucine, to promote muscle growth, repair tissues, regulate blood sugar, and provide the body with energy. L-Valine also helps stimulate the central nervous system and is needed for proper mental functioning. To recognize its critical role, Advanced BCAA+ has increased the amount of L-Valine from the standard 1G to 2G in each serving. 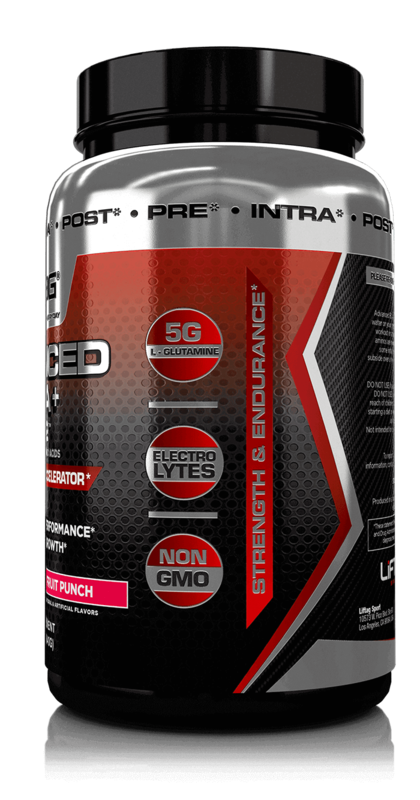 Advanced BCAA+ supplies a generous 5G of L-Glutamine. This ingredient is the most abundant free amino acid in the body; adequate supplies are crucial to elevated muscle function during intense exercise. L-Glutamine makes a unique contribution to protein synthesis to grow muscle, anti-catabolic functions which prevent muscle tissue breakdown, and growth hormone elevating effects, aiding recovery of muscle cells. 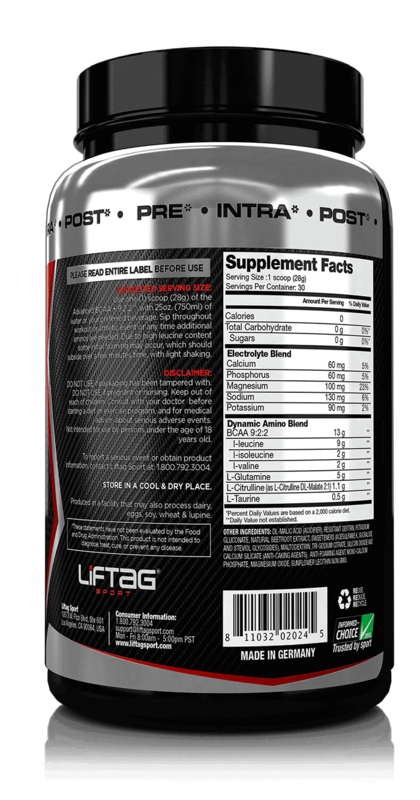 L-Citrulline Promotes blood flow providing nutrients, and oxygen to muscle tissue during workouts, increasing energy and muscle pump. This increased blood flow also contributes to recovery, decreasing post workout soreness. When you take L-citrulline DI-Malate 2:1, you’re getting both the vasodilation benefits of L-citrulline with extra fuel production contributed by malate, boosting endurance. L-Taurine is added to Advanced BCAA+ to reduce stress, and fatigue. This important amino acid works with the other ingredients to ensure optimal muscle performance, stimulate muscle growth and reduce muscle damage. L-Taurine increases cell hydration, oxidizes fat, improves pump and protects cells through antioxidant activity, improving anaerobic and aerobic athletic performance. Advanced BCAA+ has added the herbal extract Stevia, to reduce the need for artificial sweeteners in the product and eliminate the need for sugar to achieve a healthy, great tasting nutritional supplement. Stevia is naturally grown in tropical and subtropical regions where it has been used for hundreds of years to sweeten foods and treat minor medical conditions. The sugar substitute is extracted from the leaves of the Stevia plant, and then purified for use as a zero calorie, zero carbohydrate, non-glycemic sweetener. The health benefits of Sunflower Lecithin include its effects on the body as a powerful antioxidant. Unlike lecithin derived from soy, it is non-genetically modified (NON GMO). It improves sports performance, supports heart and liver functions, boosts immunity and protects the brain. Sunflower Lecithin also serves as an emulsifier to improve mixability of the BCAA+ powder. It is well recognized that athletic activity requires a consistent, high level supply of Electrolytes. Advanced BCAA+ provides balanced levels of electrolytes in the form of necessary minerals. Replenishment of electrolytes is just as important as the fuel you consume and the water you drink during exercise. Electrolytes help maintain proper pH, keeping your blood from becoming too acidic or too alkaline. Fluids (such as perspiration) deplete electrolytes. 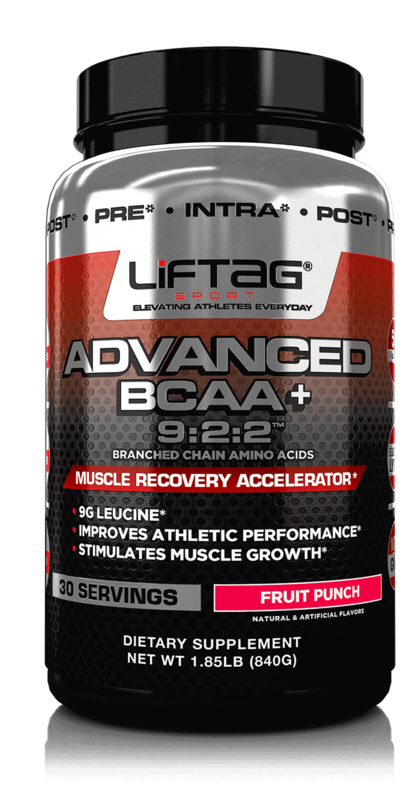 Advanced BCAA+ provides the ingredients to replace them for a successful workout.